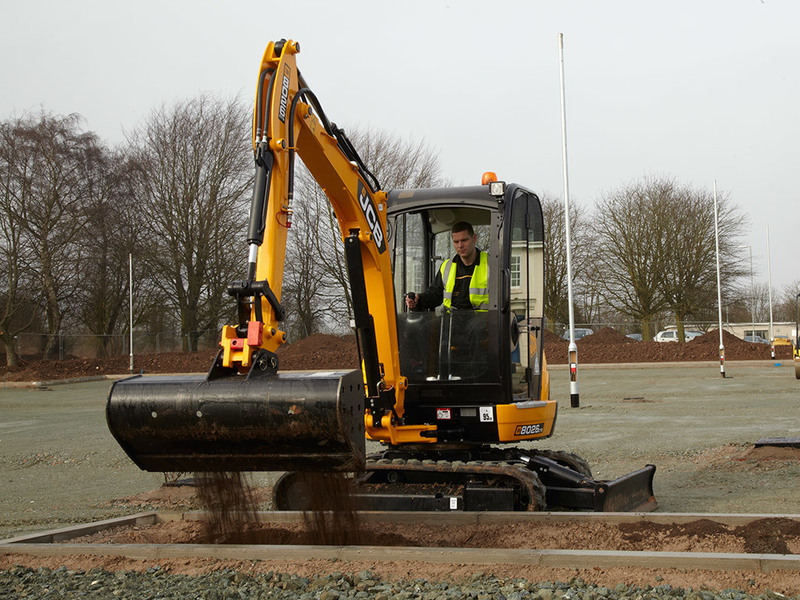 The JCB mini excavator range is designed with productivity to the fore. On the 8026 CTS, there are Nachi auto kickdown motors for smoother operation when spin turning and dozing. 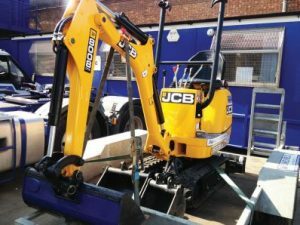 Tracking speed and single speed tractive effort are therefore class-leading, at 5 kph (11% improved over the 8025) and 25.02 kN respectively. 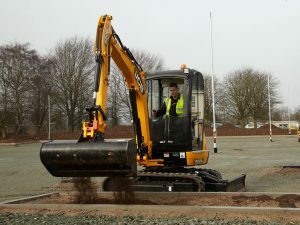 Perfect for Restricted Areas The 875kg 8008 CTS micro excavator is a compact machine, capable of high performance in the most restricted areas, including within buildings and in rear gardens. 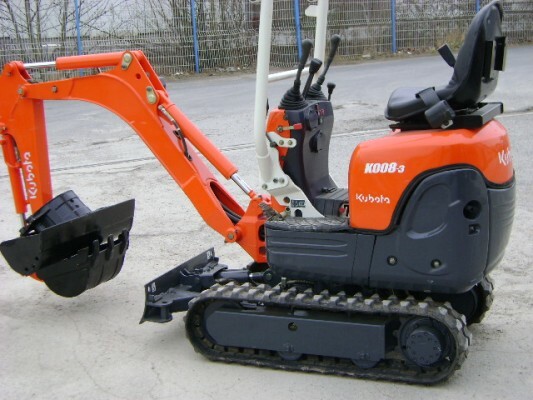 Variable Width Undercarriage To enable passage through narrow spaces such as doorways and gates, the adjustable width track frame can reduce the K008-3’s track width down to 2’4″ (700mm) by simply operating a single lever. Plus, changing the blade width is as easy as removing one pin by hand. 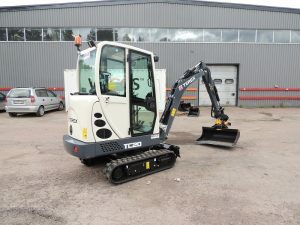 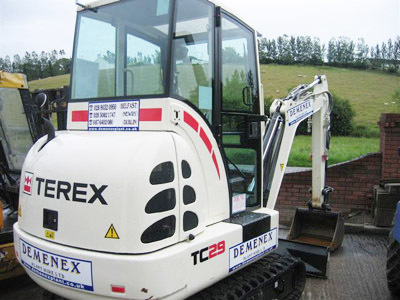 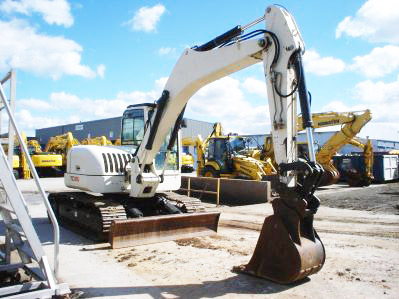 TC30 Mini Excavator The Terex® TC30 compact crawler excavator offers operators smooth, simultaneous operation with axial piston, variable displacement hydraulic pumps and motors that provide load-sensing and load independent flow division (LUDV) hydraulics. 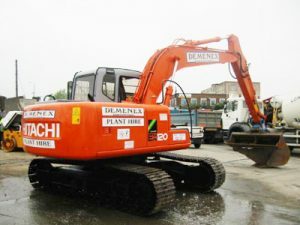 Excels in Constricted Work Environments Designed for trenching and excavating applications and offering a stable, zero-tail swing platform. 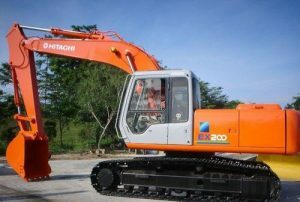 Capable of turning within its tracks, guaranteeing that the rear of the machine does not swing into nearby structures or landscaping or out into oncoming traffic during operation. 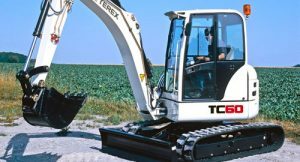 Dig Deep, Reach Tall Bridging the game between mini and large excavators, the 43-hp Terex® TC60 compact crawler excavator is an ideal solution for operators who need to dig deep, reach far and lift heavy loads on jobsites where space is at a premium. Built for Strength Reinforced D-channel side frames provide maximum cab and component impact protection. Tungsten-carbide-coated surfaces protect the critical bucket-to-arm joint. With large idlers, rollers and strutted track links, the sealed and lubricated undercarriage is built for the long haul. 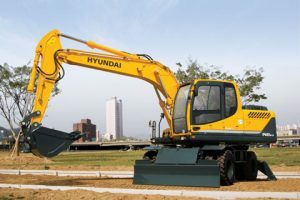 Power to Master Tough Excavating Jobs The powerful engine and hydraulic system work together to focus maximum excavating force on the job. Zaxis dominates tough work sites.